Little has been publicly known about Robert Zend’s early years in Hungary, prior to the 1956 Uprising and his subsequent immigration to Canada. I’d like to begin the process of fleshing out this period of his life. Some of the biographical material from this period will help us to understand the shaping of his cosmopolitan outlook. In addition, some background on his life in both Hungary and Canada will help to contextualize my subsequent discussion of his international affinities and influences. Robert Zend was born in Budapest, the only child of Henrik and Stephanie. Most sources indicate that he was born on December 2, 1929. However, there is some uncertainty about the date. Henrik, the youngest among many brothers and sisters, married late in life, so that Robert’s cousins were ten to twenty years older than he.1 Thus during his early years, Robert was often in the midst of adults. It was predetermined that he was to be born. The day and the hour and the minute and the second had been decided. The land and the city and the house assigned. The father and the mother chosen. In such works, it is as though a parallel universe contained all the possibilities that never came to fruition. Yearning for the unborn baby brother was not the only experience to which one could ascribe Zend’s sense of what he elsewhere calls “historical unhappenings.”9 As we will see, it was one of other events to come that would mark him with an indelible awareness of thwarted possibilities. After Robert finished the fourth grade, Henrik and Stephanie reconsidered the plan to withdraw him from school to learn a trade. Having observed his talents and listened to the entreaties of his teacher, they were convinced to cultivate the boy’s intellectual gifts rather than apprentice him to a carpenter. Childhood travels to Italy and studies at the Italian high school fostered in Robert an enduring love of languages. He went on to study literature in several other languages and twenty years later earned a graduate degree in Italian literature at the University of Toronto. His high school studies with Füsi likely influenced his decision to write about Pirandello for his master’s thesis. Tragically, Robert’s parents were among those killed during that brutal period.19 The shock and grief of his loss left a deep impression on him for the rest of his life. For four years, from 1948 to 1951 (between the ages of 19 and 22), he worked for the Press and Publicity Department of the Hungarian National Filmmaking Company, the state-controlled cinema during the Stalin regime, where he edited films, designed and produced dozens of movie posters, and wrote film reviews.26 Although many of these films appearing from the state monopoly were vehicles for political messages, for a brief time early into the Communist regime, a variety of more sophisticated films was allowed, as the poster produced by Zend of Hamlet (1948, starring Lawrence Olivier and Jean Simmons) attests (fig. 6). In the same year, he also produced a poster for Talpalatnyi föld (Treasured Earth), the first film realized by the newly nationalized film industry in Hungary (fig. 7). To earn sufficient income to help support himself, his wife, and in 1956 their newborn baby, he had to patch together a variety of short-term and part-time jobs. For four years, he worked as a free-lance journalist. In addition, he did writing and editorial work for children’s and youth magazines, edited books for the Young People’s Book Publisher, wrote reports and essays for a teacher’s magazine, wrote for the Hungarian Radio, translated poetry and essays from German, Italian, and Russian sources into Hungarian, and worked with illustrators, artists, and printing shops.29 One of his editing jobs, for example, was a 1955 guide book for the Pioneers, a socialist youth group (fig. 8). For the Zends, the years leading up to the 1956 Hungarian Revolution were not easy. Money was so tight that Robert wasn’t even able to afford a typewriter, which would have cost the couple three months’ wages. Something as basic to a poet as a typewriter was a “lifetime ambition.”37 In February 1956, Aniko was born premature, and Ibi describes her during the first eight months as “very thin, very pale, and undernourished,” as the baby didn’t have the proper food and vitamins to thrive. In 1956, Robert was on the brink of publishing his first book, a collection of one hundred poems, with a dissident publishing company, when a landmark event in Hungarian history suddenly halted his plans.39 His and Ibi’s lives were forever and drastically changed as a result of the Hungarian Uprising against Soviet rule. Journalists and university students, encouraged by the June uprising in Poland against the Soviets, began openly to question and debate the future of Hungary. 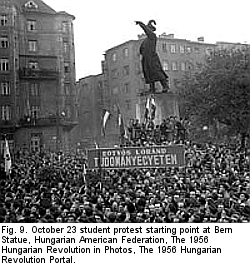 On October 23, students marched to the Parliament Building to voice their protest and list their demands for the sovereignty of Hungary, free elections, freedom of the press, and various individual freedoms severely eroded by Soviet rule (fig. 9). The demonstration ended in a massacre when government snipers and Soviet tanks opened fire on the crowd, leaving about one hundred students dead. As a result of the massacre, widespread and violent protests erupted as outraged Hungarians witnessed the extent to which the Soviets were determined to maintain their grip on the satellite country.40 During the revolt, which lasted from October 23 to 28, 1956, Hungarians engaged in fierce battle with Soviet tanks and soldiers. Victorious citizens clambered onto captured Soviet tanks and waved the Hungarian flag with the detested hammer and sickle cut from its center (fig. 10). It was also a perilous time for Zend, who had been producing and distributing leaflets encouraging Hungarians to revolt.44 If he were discovered and arrested, he could have been severely punished as a traitor. For a brief window of opportunity, he and his wife and eight-month-old baby had the chance to escape westward into Austria. A close friend, István Radó, had created fake identification papers for the escape of twenty to thirty persons, and invited Robert and his family to join the group. Fig. 13 shows the card he forged for the Zends, certifying that their apartment had been destroyed, rendering them homeless, and authorizing travel. Ibi still vividly recalls the events of their escape.53 She and Robert joined István’s group in a covered truck and hired driver. The mood was somber as she watched the cobblestones retreating through the fog as the truck drove the group of friends away from Budapest and toward Austrian border. They proceeded along back roads, taking advice along the way from fellow Hungarians about which routes were blocked by the Soviets. Fortunately, they didn’t have to use the letter, as they made their way toward the border unchallenged. However, the driver, after having promised to convey them to the border, stopped a few miles short of it and refused to go any farther. Despite feeling betrayed, the group paid him the agreed-upon fee and were compelled to walk for a few hours the rest of the way through rain and mud. They had to face one last danger when, just before arriving at the Austrian border, they were halted by a guard, a young Hungarian who had been conscripted into service to prevent his fellow countrymen from escaping. Fortunately, one of their group managed to talk (and bribe) the young man into allowing them to go peacefully on their way, persuading him that their homes had been destroyed and reassuring him that when the situation in Budapest had calmed down, they would return to Hungary — after all, he reasoned with the guard, they were patriotic Hungarians and would not desert their country forever. The bluff and bribe together softened the guard, who allowed them to continue. Finally the group crossed the border, where Austrians approached them with words of welcome and led them to American and Canadian Red Cross shelters and warm food. Such was Ibi’s relief at their safe passage that she fell to her knees and began laughing uncontrollably. Canadian and American immigration officials were stationed at the refugee camp, conducting preliminary interviews. Although the Zends had a choice of immigrating to either country, their decision to go to Canada was determined during their interview with the Americans. In 1956, McCarthyism was still casting strong suspicion on any American deemed to be associated with the Communist Party, and thus the American interviewers wanted to know the Zends’ affiliation with and allegiance to the Communist Party of Hungary and the Soviet Union. Ibi, who had been raised in a poor family, was able to get a college education and become a librarian due to the assistance and subsidy of the Hungarian Communist government. If she were to lie, denying that Communism had helped her to achieve her dream, the Americans would accept her as a political refugee. But the flip side of life under Communism was a web of lies, a suppression of truth in order to maintain a façade of harmony and prosperity. Ibi, weary of such deception, refused to conceal from the Americans her gratitude for the benefits she had derived from the Communist educational program in order to satisfy them that she would be an acceptable immigrant. Thus Ibi’s sense of integrity sealed the Zends’ decision to go to Canada. From the border Red Cross camp they traveled by train to Vienna, along with other refugees, where they stayed until their immigration paperwork was processed and they were ready to travel to their destination (fig. 15). In Vienna, many voluntary agencies had quickly organized to provide relief for the refugees, such as the National Catholic Welfare Conference, the Lutheran World Federation, the Hebrew Sheltering and Immigrant Aid Society (HIAS), the World Council of Churches, and the International Rescue Committee.55 Individuals also took the initiative to collect donations on the street to help the refugees (fig. 16). At the Canadian Embassy, the Zends obtained visas to enter Canada (fig. 17). Before moving on, they stayed in Vienna for a few days, spending time with friends whom they knew they would not see for a long time, such as Skutai Ibolya, with whom Zend had worked at the children’s magazine Pajtás (Pal) in Budapest, and István Radó, who had organized the Zends’ escape and who was headed for the United States with his family (fig. 18). Zend would remain friends with Radó for the rest of his life, often flying from Toronto to visit him at his home in Los Angeles. Taking the next step on their journey to a new country and home, the Zends gathered their few belongings in a cardboard box, took a taxi to the Vienna train station (fig. 19), and made their way to Liverpool. There, they boarded a Cunard Line ship, travelling towards a freer but uncertain future in Canada. Robert Zend (1929–1985) was a Hungarian-Canadian avant-garde writer and artist. As a young man of twenty-seven, he escaped his native Budapest during the 1956 failed Hungarian Uprising against Soviet rule and immigrated to Canada as a political refugee. He settled in Toronto, where he lived until his death in 1985. So nationality-wise, his life was divided into two parts: childhood, adolescence, and early adulthood in Hungary; and the rest of his life in Canada. According to the convention of hyphenating nationality, Zend was indeed Hungarian-Canadian. However, considering his profound distrust of labels, the classification might have seemed an attempt to delimit him as a poet and human being. Because of his cosmopolitan outlook, I’ve come to think of him as a citizen of a realm expanded and enriched by his own generous sense of a borderless community of kindred poetic minds. And it is this generosity in his international affinities and aesthetic vision that I hope to develop in this essay. It could be said that Zend had a somewhat conflicted relationship with nationality. Arriving in Canada as a political refugee, he celebrated the freedoms that had not been available to him in Soviet-controlled Hungary. And as an exile, he explored themes of alienation, loneliness, loss, and nostalgia for his native country — not unusual for immigrant writers. On the other hand, having survived war-torn Europe, where totalitarianism and zealous nationalism had fostered a culture of xenophobia, racism, and hatred, and having seen the cruelties inflicted by the Nazi and then Soviet rule in Hungary, he understood all too well the catastrophic consequences of labeling people. He developed a distrust of boundaries, be they political, social, or aesthetic. During World War II, more than 500,000 Hungarian Jews died as a result of the Nazi regime.2 And the Soviet Union, for all its propaganda of unity and egalitarianism, often used xenophobic fears to control the population, and under Stalin promoted an antisemitic campaign of murder and persecution.3 As well, many thousands of Hungarians labeled as “imperialist enemies” of the state were imprisoned, deported to forced labour camps, tortured, and executed, to say nothing of the more than 2,500 Hungarians killed during the 1956 Hungarian Uprising.4 Zend’s experiences of these brutal regimes provided cautionary models of zealous nationalism and racial paranoia and hatred. So it’s not surprising that his life’s work dissolves boundaries, and in this essay I will explore three ways in which he did so. First, his outlook was international, starting with his high school and university studies of Italian literature and readings of world literature in Hungary. And after Zend’s arrival in Toronto, Zend sought not only Canadian affinities but also artistic and literary friendships and inspiration around the world, perhaps most significantly with Argentinian writer Jorge Luis Borges but extending to writers, artists, and traditions in other countries such as France, Italy, Belgium, and Japan. Zend, no respecter of cultural boundaries, enthusiastically sought out the literature and art of other nations. Indeed, Zend’s first poetry collection, From Zero to One, reveals something of his cosmopolitan openness. He shows his indebtedness to Canadian influences with poems dedicated to Raymond Souster, Marshall McLuhan, Norman McLaren, Glenn Gould, John Robert Colombo, and professors of Italian studies J. A. Molinaro and Beatrice Corrigan. The dedications of other poems demonstrate Zend’s affinities with cultural figures from the United States (Saul Steinberg, Isaac Asimov, and Arthur C. Clarke), France (Marcel Marceau), Belgium (René Magritte), Hungary (science writer Steven Rado, actor Miklós Gábor, and artist Julius Marosán), and ancient Greece (Plato). The title of the book comes from a poetic essay by Frigyes Karinthy, who, as I will explore in greater detail in an upcoming installment, was an important Hungarian literary influence. And the dust jacket bears an exquisite portrait of Zend by French mime artist Marcel Marceau. His tributes to writers and artists sometimes takes the form of collaboration, strikingly in the case of Borges and Marceau, and ekphrastic poems, as in his response to the paintings of Belgian artist René Magritte, Hungarian-Canadian artist Marosán, and Spanish-Canadian artist Jerónimo. Secondly, his writing thematically dissolves geographical, political, and social boundaries to explore humanity’s place within the cosmos as well as fantastical realms that often involve dreams and time travel. He writes more traditionally about such subjects as romantic relationships and the dilemmas that he faced as an immigrant, but many other works develop philosophical concepts about the connectedness of all persons to one another and to the universe. Thirdly, Zend was a polymath, and he used whatever materials were at hand to create works that are multi-genre and multi-media. During his twenty-nine years in Canada he wrote poetry, essays, fiction, and plays; created collages and concrete poetry; used found objects such as cardboard tubes for creating three-dimensional visual poetry; and researched, wrote, directed, and produced over a hundred cultural documentaries for the Canadian Broadcasting Company (CBC). He was also a musician, filmmaker, and self-described “inveterate doodler.”7 A multi-media artist and chess player, he designed a chess set to be presented by the CBC to Marceau during his 1970 visit to Canada.8 And some of his works defy classification, such as the two-volume multi-genre Oāb (1983, 1985). The next two installments of my essay will highlight some major events in Zend’s life, giving biographical context to what follows, as well as offer an overview of his published works. The last installments will be devoted to the heart of my endeavour, in which I trace some of Zend’s literary affinities and influences, with special emphasis on his roots in Hungary, his transplanted roots in Canada, and his alliances with writers, artists, and cultural traditions worldwide, with particular emphasis on Argentina, France, Italy, Japan, and Belgium. And in some of the samples from his writing, you’ll see some of his cosmic and fantastical concerns. As well, I’ll reveal ways in which his visual work crosses boundaries of genre and discipline. My use of the term “cosmopolitanism” refers to a historically situated discussion in Canadian culture that came to the fore during the 1940s. The debate between the proponents of a national, nativist literature and the advocates for a more cosmopolitan view intensified when A. J. M. Smith threw down the gauntlet in favour of the latter in his 1943 anthology, The Book of Canadian Poetry. Post-World War II, this debate defined two overarching trends in Canadian poetry criticism: the desire for a national literature rooted in autochthonous themes and imagery, versus a more cosmopolitan spirit of poetry aware of currents of thought in international modernism and embracing their influence. While it is not my purpose to enter into a detailed theoretical and historical explanation of these trends, I wish to set the stage for the strong view of nationalism that gained steam with the aftermath of the Massey Commission since the 1950s, as this is the historical period that Robert Zend entered when he immigrated to Canada in 1956. My use of the term “cosmopolitan” to describe Zend’s cultural outlook does not in any way denigrate regionalism or nativism in content or aesthetic approach (or imply that Zend did so); neither does it suggest that Zend, as a political refugee from Hungary, did not admire and absorb lessons from the literature and art produced within Canadian borders. I hope to demonstrate in my analysis quite the contrary.